This morning as I read these two prompts I immediately noticed the connection. 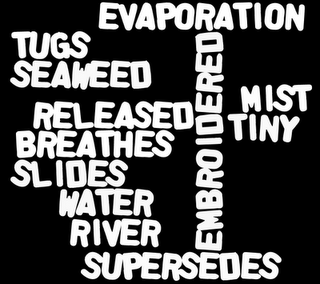 “Water” was one of the wordle words for Sunday Whirl. How much more connected could they be!? With no time to write, right then, I headed out the door for the day. All day, instead of a NEW poem forming in my mind, I couldn’t stop thinking about “Once Full“, a poem I had written for Day 20 of Poetic Asides NaPoWriMo challenge. Tonight, when I finally sat down to write, it was a bit more of the story surrounding “Once Full” that came from my fingers on the keyboard, rather than something new. I’d love to know what you think…does it add to the original? Or should I have left the original alone and started from scratch with the wordle words?